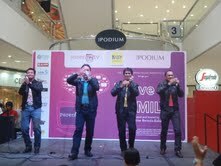 Parentin.tv recently held a forum at the Podium mall in Ortigas. 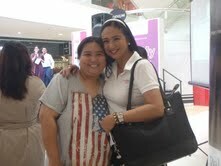 Ms. Tintin Bersola-Babao hosted the event along with Anthony Taberna's lovely wife whose name I forgot. (sorry!). 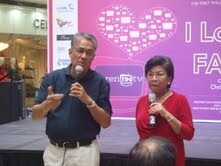 Members of the online community, Parentin.tv were treated to different talks with topics about the family. Three mommies were also lucky to be treated for a total makeover from David's Salon and Bayo. Rainmakers also serenaded the guests and fathers who were present were also given long-stemmed roses as an early Valentine treat. Josiah's catering also served yummy chocolate and fruit fountains. While Belo Essentials provided the lootbags that was given away to loyal members. 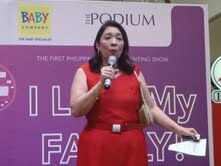 Ms. Maribel Sioson-Dionisio gave a talk on emoitonal parenting. 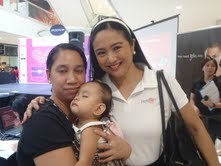 With Ms. Tintin Bersola-Babao and Parentin.tv member Nelly Quijano and baby Francine. Couple speakers who spoke about how marriage work. Rainmakers performed during the show. Anthony Taberna's lovely wife co-hosted with Titntin. Belo Essentials sponsored the lootbags. Who says that Belo is only for women? There's Belo for Men too. The author with Ms. Tintin. Special thanks to my good friend Vix for allowing me to use the photos.